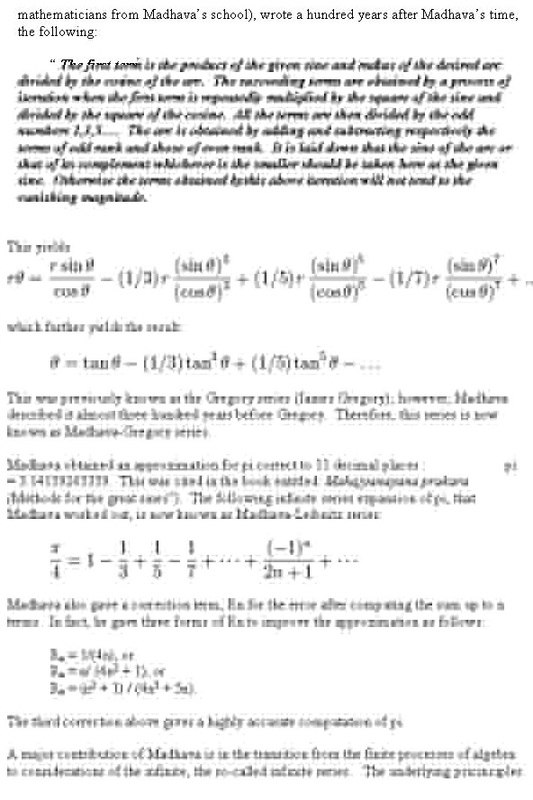 “The ingenious method of expressing every possible number using a set of ten symbols (each symbol having a place value and an absolute value) emerged from India. The idea seems so simple nowadays that its significance and profound importance is no longer appreciated. Its simplicity lies in the way it facilitated calculation and places arithmetic foremost amongst useful inventions.The importance of this invention is more readily appreciated when one considers that it was beyond the two greatest men of Antiquity, Archimedes and Apollonius." Pierre-Simon Laplace. In the long and distinguished history of India, it has scored many firsts. It made the first civilization (at least three thousand years before the Sumerians), it was the first country to experiment with democracy (in a town called Vaishali in present day state of Bihar), centuries before the Greeks, the first to codify medical and surgical practice (Charaka and Susruta respectively), the first to organize religion(Hinduism) and delve deep into theology and philosophy, first to delve into writing great treatises in both verse and prose, the first to recognize gravitation (this was at least a Millennium before Newton), the first to describe the elliptical orbits of planets around the sun, to describe how solar and lunar eclipses occur, theorize that earth rotated on its axis, thus giving the illusion of heavenly bodies revolving around earth, (these predated the Europeans by more than a millennia! ), the first to produce steel, invent the game of chess, invent martial arts (“KalarippayatT”) etc, etc. 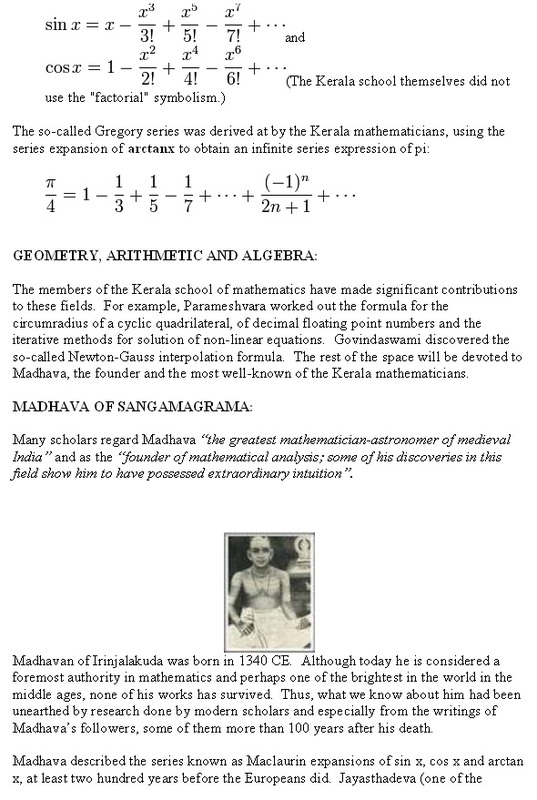 However, India’s greatest gift to the world was in the field of mathematics. 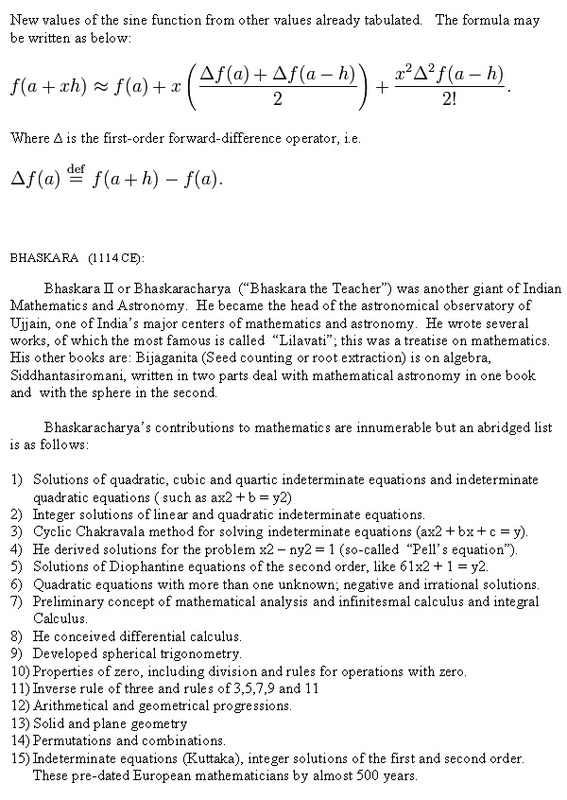 India pioneered almost every field of mathematics, from the numeral system and arithmetical principles of addition, subtraction, multiplication and division, to the invention of zero and the notion of infinity, to the power and place value and decimal systems, geometry and many of the theorems traditionally attributed and named after the Greeks or other Europeans, algebra, trigonometry and even significant parts of calculus were all developed by Indians to a significant degree of finesse, all long before any country or individual that the Europeans have given such credits hitherto. 3) Prominent practitioners of mathematics through India’s history and their contributions to the field.As there are numerous mathematicians of renown in India’s history, only the most important and pivotal personalities will be discussed in separate sections. In some instances, and when appropriate, the work of some of the mathematicians may be covered within the text of discussion topic. When appropriate, a more focused description of systems or schools of mathematics in different parts of India. Everyone recognizes that the earliest contribution of India to this field was the ten-base system but actual dates are not known. In order to keep this section factual, I will restrict my descriptions to mostly what is historically known.However, as new information becomes available, this section will necessarily need revision.We now know that at least a large city-dwelling population existed in a place called Dwarka (which is now submerged off the coast of Gujarat. (Please check this video presentation: www.indiancentury.com/dwar.htm), approximately 9,500 years ago.If recordings from this city show mathematical notations, clearly the story of mathematics will become that much older. What is historically known goes back to the days of the Harappa civilization, 2600-3000 BCE.Since this Indian civilization delved into commerce and cultural activities, it was only natural that they devise systems of weights and measurements.For example a bronze rod marked in units of 0.367 inches was discovered and point to the degree of accuracy they demanded.Evidently, such accuracy was required for town planning and construction projects. Weights corresponding to 0.05, 0.1, 0.2, 0.5, 1, 2, 5, 10, 20, 50, 100, 200 and 500 have been discovered and they obviously played important parts in trade and commerce development. 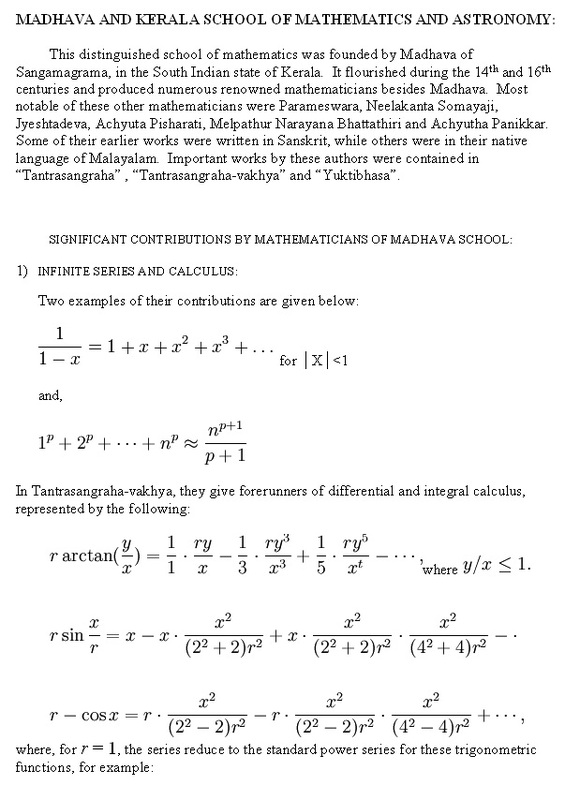 The next phases of mathematics developments are found in Vedic texts, along with ritual practices, and in the Puranas.Calculations for the precise building of ritual altars would have been important, for obvious reasons.Arithmetic principles such as addition, subtraction, multiplication, fractions, cubes, squares and roots were developed during these periods (Narad Vishnu Purana (by Ved Vyas ~1000 BCE)).Geometric principles (“Rekha-ganit) are found in the Sulva Sutras, authored by Baudhayana (800 BCE) and Apasthamba (600 BCE).Calculations of one geometric shape (for example a rectangle) and converting them to an equivalent (or fraction or multiple thereof) square or circle would require a good working knowledge of geometry. 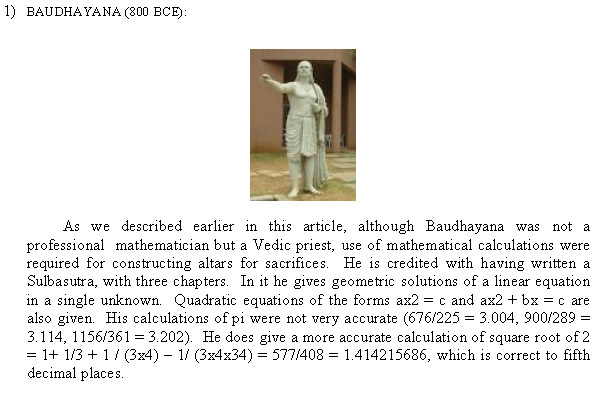 Pythagoras, who studied mathematics in India (6th century BCE), became familiar with the principles of geometry from the Sulva Sutras.Even the so-called Pythagoras theorem was described by Baudhayana in his Sutra. 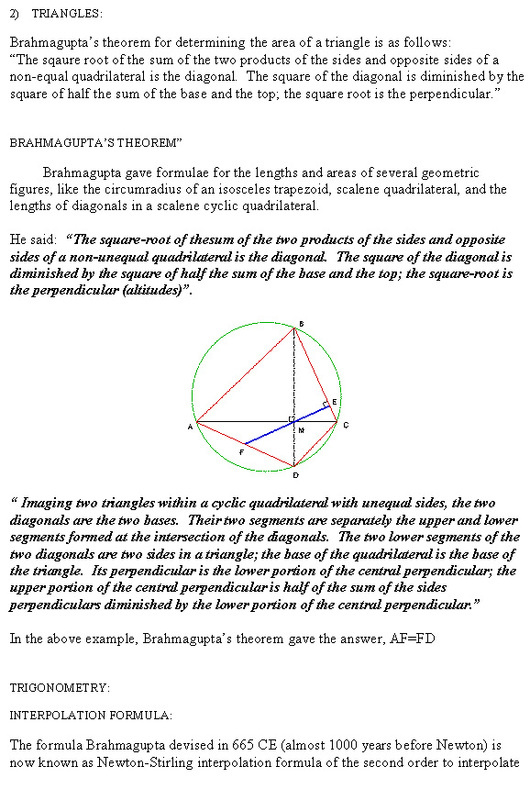 (“The chord that is stretched across the diagonal of a square produces an area of double the size”).His Sutra also contained geometric solutions of a linear equation in a single unknown and even examples of quadratic equations.Apasthamba Sutra described calculation of the value for the square root of 2, accurate to the fifth decimal place.A solution to the general linear equation is also described in this Sutra and the squaring of a circle and dividing a segment into seven equal parts. 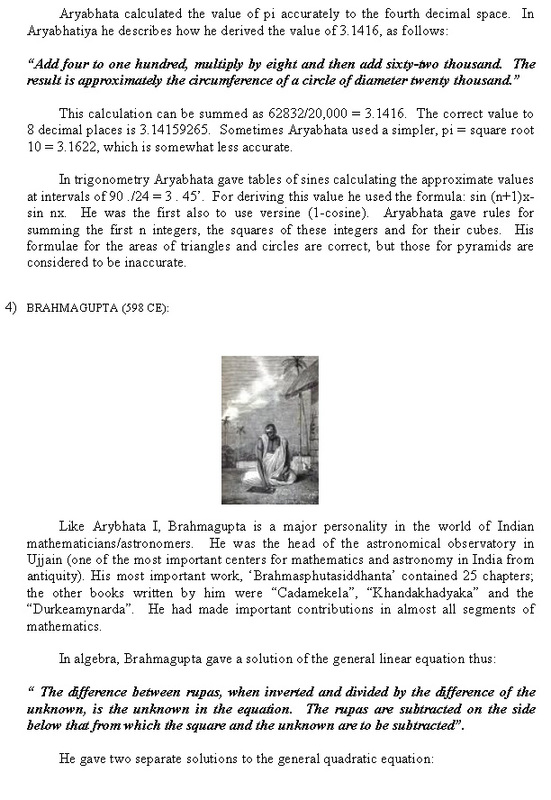 “Whilst we use letters for calculation according to their numerical value, the Indians do not use letters at all for arithmetic.And just as shape of the letters that they use for writing is different in different regions of their country, so the numerical symbols vary”. “What we (the Arabs) use for numerals is a selection of the best and most regular figures in India”. 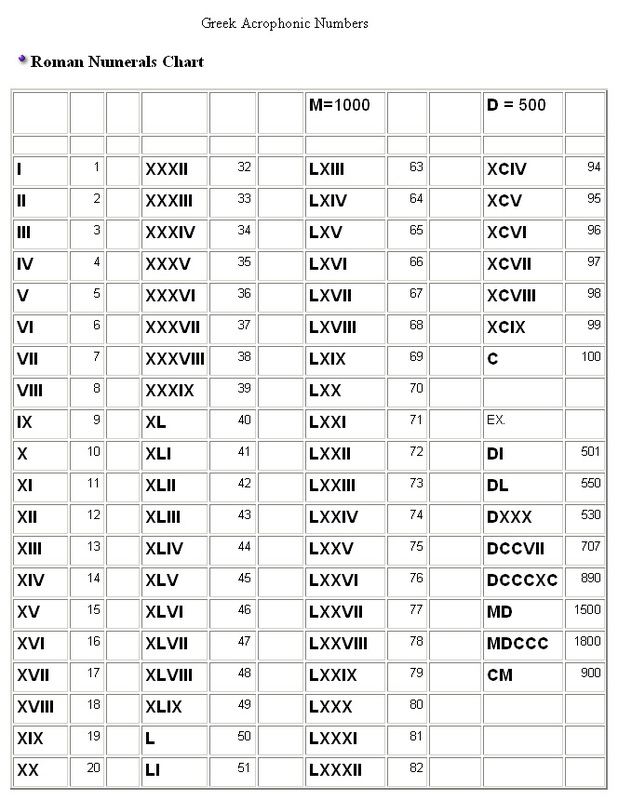 Another special aspect of the Indian numeral system is the place-value system that is embedded in it.This means that each numeral is given a value related to its position in the count, relative to the other numerals. 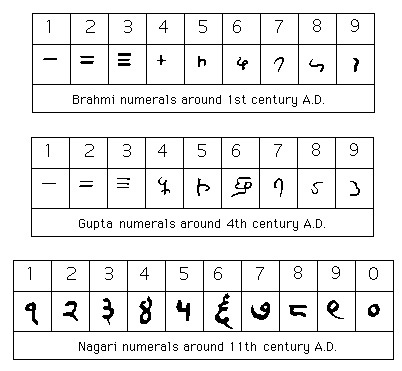 In itself, this is not unique to the Indian numeral system and Indians were not the earliest to make such assignments. 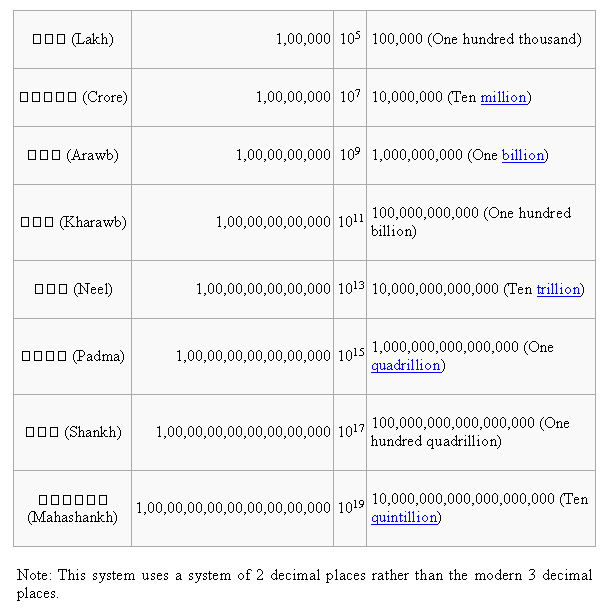 Babylonians also ascribed relative values to each numeral but their system’s flaw was that it was a base 60 system.The origin of the modern decimal-based place value system is ascribed to Aryabhata I, 498 CE. Or at least he was aware of this system as noted below: This fact is clear in his statement: “Sthanam sthanam dasa gunam” (“place to place in ten times in value”). The oldest record of this value place assignment is in a document recorded in 594 CE, a donation charter of Dadda III of Sankheda in Bharukachcha region. 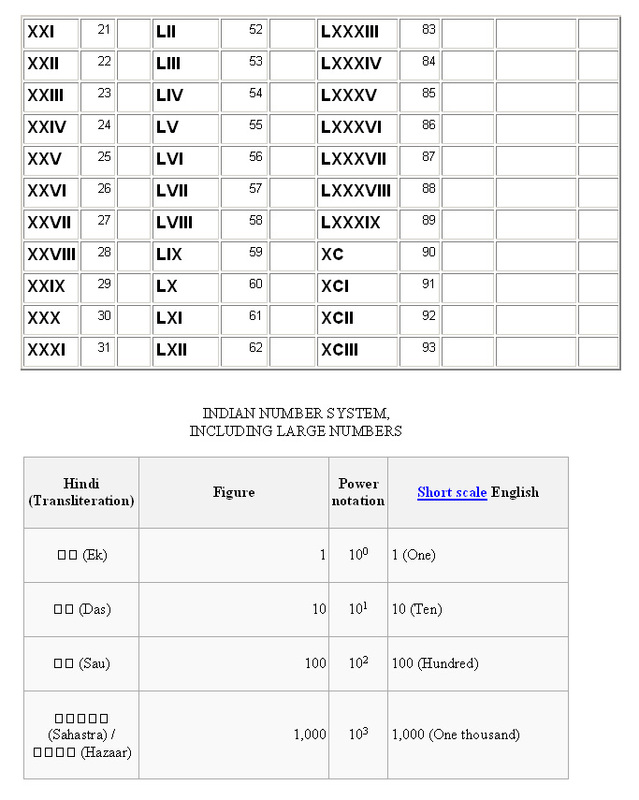 No satisfactory explanation exists as to why the Greeks did not develop this place value system; one can only conjecture that this was due to the inherent deficiency of the base 60 system that they adopted from the Babylonians.The Chinese system employed pseudo-positional number rods, which some claim was transmitted to the Indians and became the basis of the Indian numeral system. 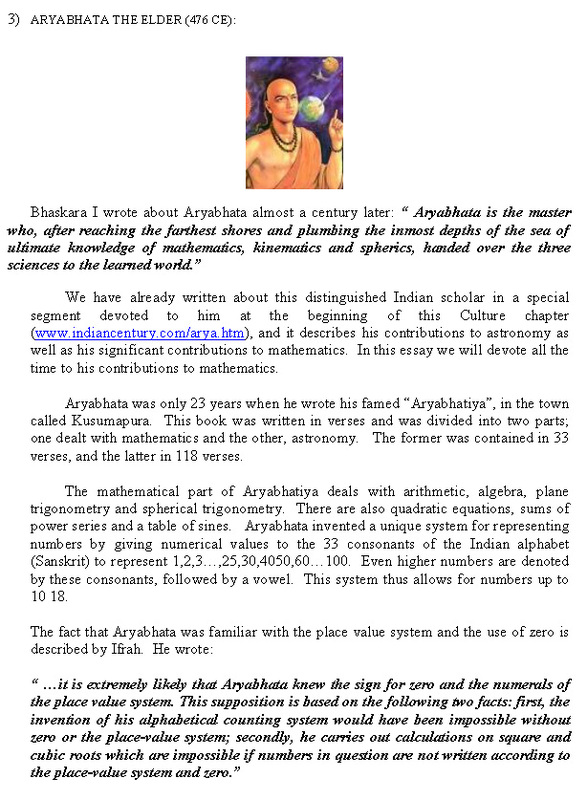 Some have also claimed that the Indians derived their numeral system from Archimedes’ Sand-reckoner. 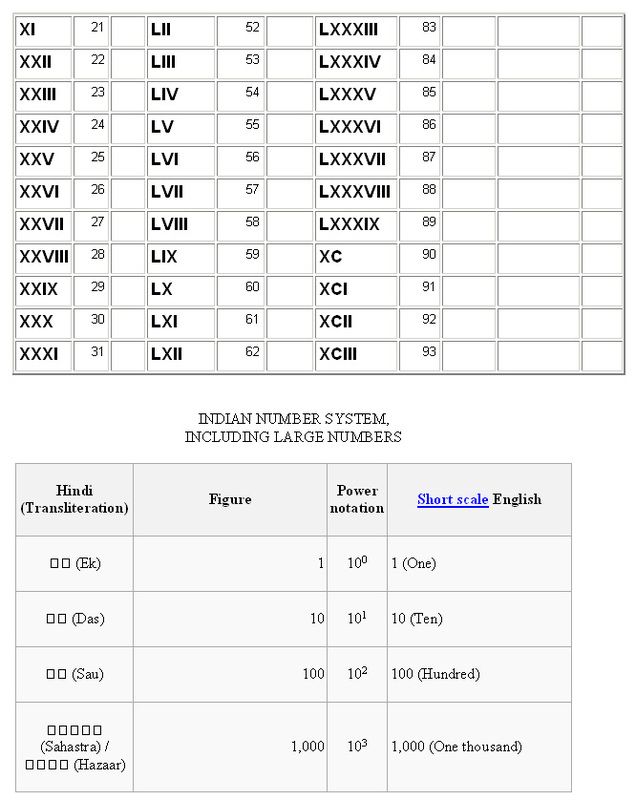 What is undisputed, however, is that the Indian numeral system is the basis of the modern numerals everywhere and that it was transmitted to the rest of the world by the Arabs.
" 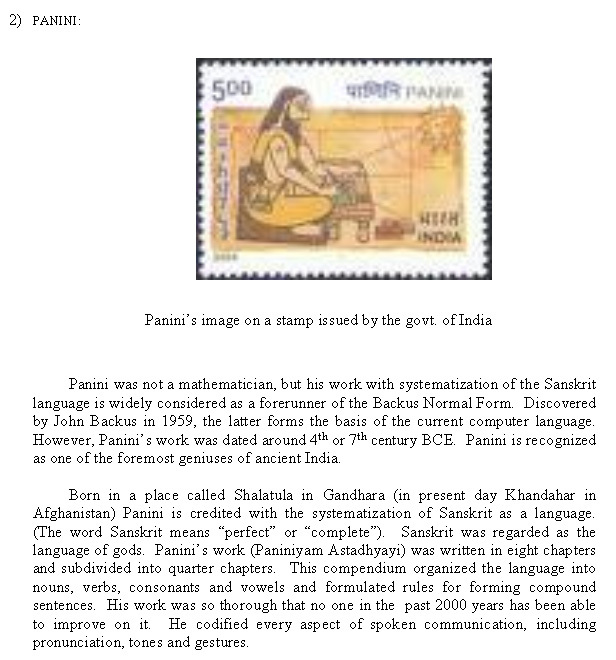 Thus it would seem highly probable under the circumstances that the discovery of zero and the place-value system were inventions unique to the Indian civilization. 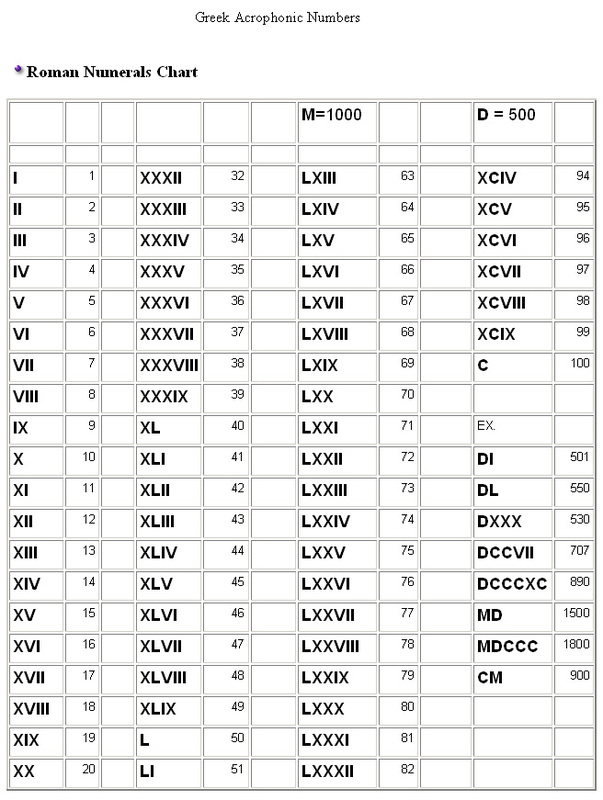 As the Brahmi notation of the first nine whole numbers (incontestably the graphical origin of our present-day numerals and of all the decimal numeral systems in use in India, Southeast and Central Asia and the Near East) was autochthonous and free of any outside influence, there can be no doubt that our decimal place-value system was born in India and was the product of Indian civilization alone." The earliest recorded inscription of decimal digits to include the symbol for the digit zero, a small circle, was found at the Chaturbhuja Temple at Gwalior, India, dated 876 CE.The oldest known text to use a decimal place-value system, including zero was found in a Jain text from India, the Lokavibhaga, and dated 458 CE. 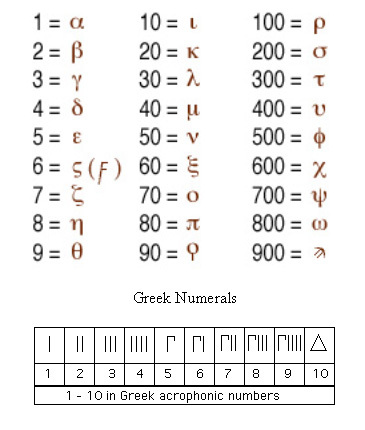 Thus, assigning a different character for each digit as well as the place value system and the addition of a zero to form the decimal system enabled Indians to write numbers of any value.Babylonians used a space between their sexagesimal numerals for a positional value; however, they did not use zero as a separate number.By 300 BCE two slanted wedges were used as a punctuation symbol for a place-holder in the Babylonian system. Again, they did not use this ‘zero’ as a separate number.The Mesoamerican Long Count calendar from South Central Mexico and Central America did use a zero as a place-holder in their vigesimal (base 20) positional numeral system.This invention is credited to the Olmecs, around the end of the 4th century BCE.Zero was not, however, used by the Olmecs as a separate number.The Chinese used counting rods for calculations as early as the 4th century BCE.They understood the negative numbers and zero but they had no symbol for zero until the age of the Song Dynasty in 1247 when the mathematician Qin Jiushao proposed a symbol for zero. 1) The sum of zero and a negative number is negative. 2) The sum of zero and a positive number is positive. 3) The sum of zero and zero is zero. 4) The sum of a positive and a negative is their difference; or, if their absolute values are equal, zero. 5) A positive or negative number when divided by zero is a fraction, with zero as denominator. 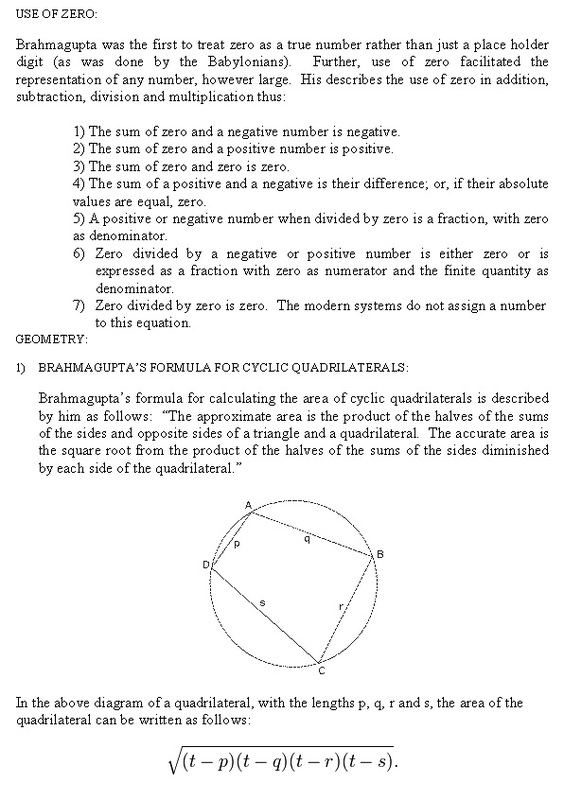 6) Zero divided by a negative or positive number is either zero or is expressed as a fraction with zero as numerator and the finite quantity as denominator. Jaina mathematicians were practitioners of Jainism and belong to the period following 6th century BCE.They have the distinction of being a bridge between the Vedic Period in mathematics to the so-called Classical Period. They are also credited with extricating mathematics from religious rituals, as used to be the case with the Hindus.Jains’ fascination with large numbers directly led them to classifying such large numbers into the enumerable, the innumerable or the infinite. Jain mathematicians are credited with defining infinity into many types: infinity in one direction, infinity in two directions, the infinite in area, the infinite everywhere and the infinite perpetually.A well-recognized Jaina mathematician is Pingala (300 ~ 200 BCE).Although not strictly a mathematician but a musical theorist, he is credited with stumbling upon the Binary numeral system.He is also credited with discovering the “Pascal triangle” and the Binominal coefficient.Basic concepts of the Fibonacci numbers have also been described by Pingala. Written on birch bark, this is the oldest manuscript on mathematics in South Asia.This was accidentally discovered by a farmer while digging in a place called Bakshali near the modern city of Peshawar, now in Pakistan.The manuscript is now preserved in the Bodleian Library in Oxford University.No one is certain about the date of the manuscript, but it is widely considered to date between the 7th and 12th century CE.Topics in arithmetic, algebra and arithmetic progression are discussed in some detail in these manuscripts. 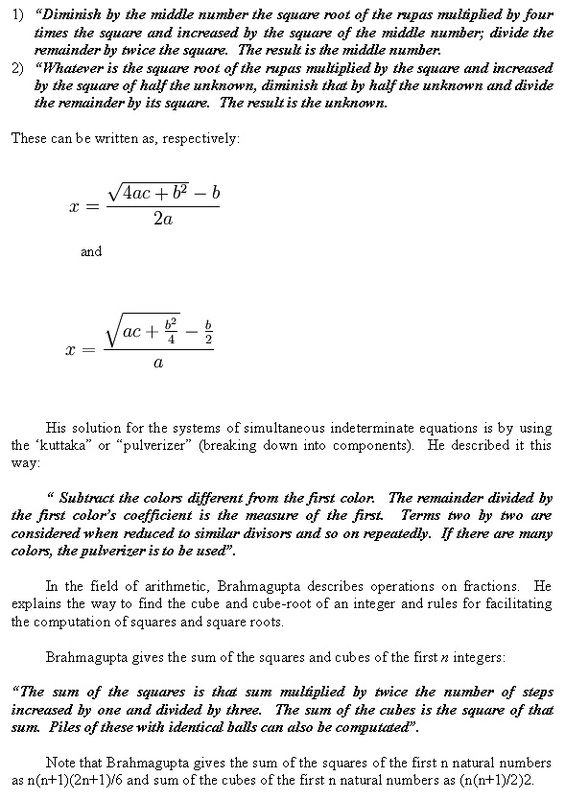 In order to cover the field in a consistent manner, I will present the most significant practitioners of Indian mathematics strictly in a chronological order.Also, for the sake of brevity, only the most important mathematicians and their contributions will be outlined.